Back yard space for entertaining includes a gas fire-pit, infinity-edge water fountain, and curving steel and cedar pergola. Floor is paved with Cut Bluestone and features a soft green divider. Rain garden helps collect and divert water around the patio and down the slope. Ipe deck with stainless steel cable railings and wide easy-to-navigate steps provides dining space next to the kitchen and access to the patio below. Dry seating area below deck provides another intimate space. 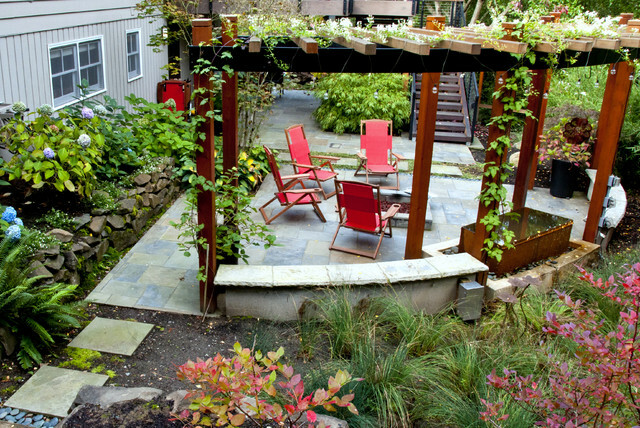 Front yard design takes advantage of mature maples, while updating plantings and adding lovely cedar and steel screens. what kind of vine to use so it can spread fast? What pavers are used for the patio? Need help with outdoor furniture - Can you please tell me what brand of chairs these are? I have been searching high and low for something like what is shown here. Aren't those great? From a big box store, I think, although I don't remember which one. How does the pergola posts set on the bluestone? Idea for additional seating area. Pergola in sunken area extending from wall? Do we get a fire pit for under pergola? Like the curves and combination of wood and steel.